According to the results of 2013 refueled by the Aerofuels Group in the Russian and international airports aviation kerosene volume growth is 7% having increased up to 750 thousand tons. At the present time the Aerofuels Group supplies the Russian and international carriers with kerosene in 29 Russian airports and is able to arrange jet fuel supply to more than 1000 airports worldwide. Jet fuel sales volume growth is provided due to several factors including passenger flow growth, entry into perspective markets and new customers’ attraction. Many key customers of the Aerofuels Group - the Russian aviation companies have increased traffic volume in the Russian regions significantly and have extended their geographic footprint abroad. Vladimir Spiridonov, Aerofuels Group General Director, became Entrepreneur Of The Year® - 2013 Award winner has been awarded in the nomination B2B. Finals of the national round of the competition took place in Moscow on November 28th, where ten best entrepreneurs of the year on the independent jury opinion were announced. This competition among business owners or companies top managers significantly contributing to business development and having turned their companies into competitive participants of the market or the branch of industry leader, has been held by EY (Ernst&Yang) company for 28 years and is rightfully considered the most prestigious international competition in the field of entrepreneur activity. Today it spreads over about 145 cities in more than 60 countries of the world. This competition has been held in Russia for 11 years already. Preliminary rounds take place in many Russian regions, and in the result the independent jury members make the list of 30 winner nominees – entrepreneurs from different fields of economy. In 2013 Vladimir Spiridonov, Aerofuels Group, and Vitaliy Savelyev, Aeroflot, were the only two nominees representing aviation. Vladimir Spiridonov, Aerofuels Group General Director, joined Entrepreneur Of The Year® - 2013 Award competition winner nominees in Russia. Preliminary rounds took place in many Russian regions, and in the result the independent jury members made the list of 30 winner nominees from different fields of economy. Vladimir Spiridonov, Aerofuels Group, and Vitaliy Savelyev, Aeroflot, were the only two nominees representing aviation. Entrepreneur Of The Year® Award has been held by EY (Ernst&Yang) company for 28 years and is rightfully considered the most prestigious international competition in the field of entrepreneur activity. Today it spreads over about 145 cities in more than 60 countries of the world. Entrepreneur Of The Year® Award program makes it possible to mark the most successful entrepreneurs, giving opportunity to share their success story and to inspire others with their ideas. The first competition of Entrepreneur Of The Year® Award was held in1986 in the USA, in the city of Milwaukee, Wisconsin. For last five years more than 6500 entrepreneurs have become the participants of this competition and members of the entrepreneurs’ international association. They include managers of the companies known all over the world, with more than half of them joining NASDAQ-100. It is worth mentioning that success of many managers was marked by EY experts even before their companies entered this index. Group of Companies Aerofuels acquired the second oil depot in the Tomsk area and recently it has received the certificate of ownership. The depot is situated in the vicinity of the fuel and lubricant depot having been acquired in 2011. Aerofuels Group is planning to build one of the largest oil depots in the Tomsk area. In the result of both facilities uniting the depot capacity will make 20 thousand m³. The amount of expected investments into the terminal is 270 mln rubles during next 3 years. “We think that creation of the largest transfer terminal in the Tomsk area to support, first of all, oil products export from the region will make it possible for local companies to cut costs in logistics and to enter the national and international market by arranging heavy and light oil products supply by railway”, - said Yury Popov, TZK Aerofuels General Director. “Besides, such facility operation will provide extra qualified workplaces and tax payment to the area budget”, - he added. Within the frameworks of oil spill response drill training TZK Tomsk (a member of Group of Companies Aerofuels) and Ministry of Emergency Situations conducted the training in emergency situations remedial actions. Ministry of Emergency Situations officials together with TZK Tomsk specialists took part in this event. The training scenario dealt with the situation simulating spillage of 2000 m³ kerosene. Upon arriving the specialists of rescue-firefighting centre and Tomsk oil depot emergency teams had to stop oil products further spreading and then to clean the fuel and lubricant depot territory. All emergency teams completed the task successfully and mastered their skills in emergency situations remedial actions. TZK Tomsk has been a member of Group of Companies Aerofuels since 2011 and it offers a full set of services dealing with acceptance, storage and delivery of diesel fuel, benzene and aviation kerosene over the Tomsk area. The depot makes it convenient additionally to achieve a quick and on-time supply of oil products to the city and the area consumers, as well as to support the Tomsk refineries products export to other regions of Russia. 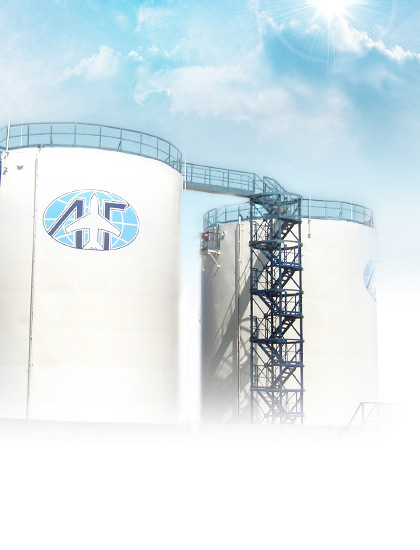 At present the oil depot is a modern highly effective facility for oil products transfer. The Group of Companies Aerofuels is constantly working at the depot upgrading, re-equipment and expansion. Approximately 100 mln rubles have been invested into the fuel and lubricant depot since it was acquired. Results of Shell&Aerofuels inspection earlier performed by the North-West Directorate of Rostekhnadzor were overturned. Federal service for environmental, technological and nuclear supervision (Rostekhnadzor) took up a decision to cancel results of Shell&Aerofuels CJSC (Aerofuels Group member) inspection in Pulkovo airport: conclusions upon the inspection results provided in the Act dated 24.04.2013 were overturned. Unscheduled inspection was performed by the North-West Directorate of Rostekhnadzor in April this year after attorneys at law "YuKS" managing partner V.I. Chesnykh sent an application about Shell&Aerofuels CJSC alleged violation of the active law. Shell&Aerofuels CJSC documented their disagreement with the inspection results and sent a substantiated response to Rostekhnadzor. After Rostekhnadzor deputy manager has studied the company letters and the regional directorate inspection material, the federal service arrived at a decision to cancel the inspection Act. Taking this fact into consideration, Aerofuels Group of companies keeps thinking that attorneys at law "YuKS" managing partner V.I. Chesnykh actions with sending application to different services with attempts to start various inspections regarding legality of the alternative refuelling company business activity at one of the biggest airports of Russia deal with keeping monopoly in the field of aviation fuel supply in Pulkovo airport but not with flights safety concern. Group of companies Aerofuels has moved up to ten points in the rating "400 largest companies of Russia"
Group of companies Aerofuels ranks 307 in "400 largest companies of Russia" annual rating published this week, moved ten points up. The main parameter to join this rating is the annual volume of products and services performance. In 2012 Aerofuels Group of companies income was 22, 526 mln. rubles, and the growth rate in relation to the previous period was 14.3 %. Such growth appeared to be above the average as according to Expert rating agency information, 400 largest companies increased their income only by 10.4% in 2012. The main goal of "Expert-400" project is to find the largest companies of the Russian economy and to analyze a role of big business in the economic development of Russia, its structure and main tendencies of development on the basis of their business activity results. The rating contributes in the Russian economy transparency, thus favoring its activization, partnership relations and investments inflow. Today "Expert-400" rating is the most representative list of the Russian leading companies. Over the years of its existence the rating received recognition in Russia and abroad as well, it is widely referred to by the Russian and international mass-media. As per information which Aerofuels Group of Companies has, some Moscow PR-agency tries to distribute information of negative nature through mass media concerning both the company`s operations and that of Shell&Aerofuels JV (Shell Concern is a joint venture, one of the largest direct foreign investors in the Russian economy, and Aerofuels Group, one of the largest jet fuel supply operators) in Pulkovo airport, disregarding the fact that now this negative information is being contested legislatively in court. Group of Companies Aerofuels would like to express their gratitude to a considered viewpoint of most of the mass media judging upon the events realistically and remaining unprovoked by black PR methods. S7 Airlines conducted a scheduled auditing of TZK Irkutsk LLC (a member of Aerofuels Group of Companies) and found compliance of the company with the airline requirements in fuel supply. Within the frameworks of the operation quality inner control S7 Airlines conduct such audits of the servicing companies in the part of actual condition of the material and technical resources, works safety, environment protection and technological interaction assessment in order to optimize the quality and time of company services. The airline representatives acquainted with quality and compliance with the declared scope of the tank farm, with condition of quality control laboratory of aviation combustive and lubricating materials, aerodrome refuelling vehicles, with conformance to norms and standards of jet fuel supply and etc. Upon the audit completion S7 Airlines representatives gave a positive opinion about the refuelling complex. As the audit report shows, all recommendations regarding to jet fuel supply of the airline flights are taken into account by Aerofuels Group, which allows S7 Airlines, in their turn, making aviation services for their passengers with high quality and safety. In acknowledgement of a longstanding and fruitful cooperation the airline company delegation together with Aerofuels Group members planted a fir-tree in the territory of the refuelling complex. S7 Airlines, ranking among the leaders of the civil aviation, is a frequent customer of Aerofuels Group of Companies both in the airports of Russia and abroad. Specialists of Shell and Aerofuels Company participated in the conference in Domodedovo airport. The meeting was held in Domodedovo Moscow airport on August 13 for discussion of aviation fuel provision issues. Representatives of the leading companies of the branch including GosNII GA, Lukoil, Gazpromneft, Rosneft, Shell and Aerofuels and Domodedovo Fuel Services gathered at the conference arranged by the International Air Transportation Association (IATA). The experts reviewed the issues connected with regulatory environment and technical documentation of aviation fuel provision in Russia. The attention of the specialists was focused on the following issues: acceptance and storage of aviation fuel and aircrafts refuelling, problems of Russian documentation conformity to foreign requirements in connection with introduction of the standard of the International Civil Aviation Organization (ICAO) 9977. Aerofuels Group of Companies will invest 380 mln. rubles in the second half of 2013 into construction, reconstruction and technical reequipment of the warehouses of aviation fuels and lubricants as well as into the purchase of new refuellers and special equipment. Investment will be mainly directed to fuelling complexes of Pulkovo, Nizhny Novgorod, Kurgan, Tomsk, Kirov and Yuzhno-Sakhalinsk. Reequipment of the three laboratories of aviation fuels and lubricants quality control by modern equipment is also planned. Aerofuels International – world without borders. The Company offers aviation fuel provision to exotic countries. One of the flagships of Aerofuels Group of companies – Aerofuels International marked 18 years in the summer 2013. During this period aviation carriers, the customers of the company gained the possibility to refuel their aircrafts in more than 1000 world’s airports nearly worldwide. Aerofuels International partners include the largest transnational oil companies such as ShellAviation, ExxonMobil, BritishPetroleum, ChevronTexaco, Hanwha, KuwaitPetroleum, StatOil and others. Nowadays the customers of Aerofuels International in foreign airports include not only Russian aviation carriers but also foreign ones that gives us evidence of the professionalism of the employees and of high level of trust to the Russian company. Aviation carriers refuel their flights through Aerofuels Group in all European countries, USA, Canada etc. However, during their extensive practice the managers of Aerofuels International had to arrange refuelling in rather exotic countries within the shortest possible time: Greenland, Northern Mariana Islands, Tanzania, Timor, Guam, Laos and Cambodia, Cote d’Ivoire – this is just an incomplete list of exotic places where Russian airlines have been refuelled thanks to Aerofuels International. “We often need to refuel not only regular but also special flights in different spots of our planet. We are glad that our work allows the airlines and their passengers filling welcome in the airspace and move nearly without any limitations”, - says Gennady Pavlenko, the General Director of Aerofuels International. Aerofuels Group refuels Red Wings in Russia and abroad again. Right after flights resumption from July 2013 Aerofuels Group has added Red Wings airline to their customers. The aviation carrier chose Aerofuels Group as the kerosene and refueling service supplier in Vladivostok and Irkutsk. Abroad Aerofuels arranges Red Wings refueling in the airports of Bulgaria, Croatia, Montenegro and Greece. «Today Red Wings airline has gained a reputation of a reliable and a long-term partner. We are glad that airline maintaining the air craft fleet exclusively of the Russian production has started passengers carriage again» - said Yury Popov, TZK Aerofuels General Director. «We are ready for any expansion of Red Wings route network. Our possibilities in refueling abroad are practically unlimited», - Gennady Pavlenko, Aerofuels International General Director added. Aerofuels Group has started refueling of Tatarstan and Avia Management Group flights participating in the Federal Program on the regional traffic sponsorship in Privolzhsky Federal District from June in the airports of Kirov, Perm, Ufa and Ulyanovsk. Taking into consideration significance of this program to provide air service availability for the public and to develop inter-regional connections, Aerofuels Group decided to grant a good discount for kerosene to the airlines carrying out flights between the cities of Povolzhye when refueling aircrafts in the refueling complexes of Aerofuels. Discounts amount makes it possible to save from 3500 to 4500 rubles per a ton of fuel, which will allow aviation fuel supply costs reduction up to 10%. «We expect that discounts offered to airlines for flights included into the sponsorship program will additionally help to settle one of the regional traffic development issues – to reduce cost, and it will help to achieve main goals – transport accessibility of the Russian Federation regions and their population aviation mobility», - said Vladimir Spiridonov, Aerofuels group General Director. On July 20th the first refueling of Angara airline new regular flight in Vladivostok took place supported by the refueling complex TDK and Aerofuels Kamchatka refueling company (members of Aerofuels Group). This absolutely new flight of Angara airline has connected Vladivostok and Irkutsk. Flights are carried out aboard of AN-148-100E aircrafts, flying time being 4 hours 20 minutes. «Today three refueling companies operate in the competitive environment in the airport of Vladivostok. We are glad that Angara aviation carrier has chosen our group of companies for their new flight aviation fuel supply» - said Evgeny Stefanyuk, Aerofuels Kamchatka Director. Angara is also the company customer in the airports of Blagoveshchensk, Ust-Kut and Verhnemarkovo.